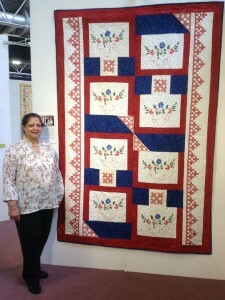 Pindy’s ‘Memory’ quilt was made to save embroidery, done by her mother, on sheets that were part of her dowry. She talks about how she struggled to come up with a design for the quilt and the emotion of cutting up the fabric. 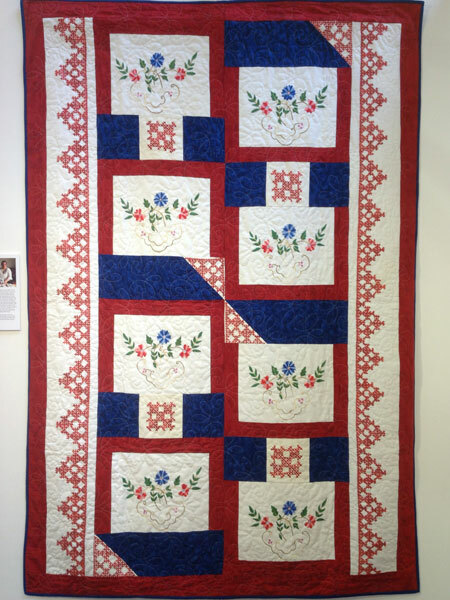 Pindy sought out a new hobby as respite from caring responsibilities, and found a quilt group who give advice and support while she made this quilt. Later Pindy reminiscences about sewing projects she did as a child, her interest in quilt design and colours, as well as describing her ‘quilting corner’. Pindy Pardesi [PP] You are welcome. MS: Pindy would you tell me about your touchstone please? PP: Um, that… I decided to make the quilt because, um, my mother gave me some stuff for my dowry and, er, my, um, bed sheets were embroidered by mother 50, er, 50, 60 years ago which was part of my dowry. And, um, I really… er, my mother isn’t here anymore and it was very close to my heart. And the number of times I decided to throw it away ’cause I can’t do anything with it and then put it in a bag, bring it out [coughs], put it in a bag, bring it out. I couldn’t take it to the jumble sale and it was very, very [coughing in background] close to my heart and I kept on saying, I’m sure I can save that embroidery. I can… I’m sure I can something with it. And at that time I was working and, and I, um, really didn’t have time to spend any time thinking how I’m going to save this embroidery bit to have it as a memory quilt for… from my mother. So I would… I had this two and throw, to and throw for a long time, until I finished work and decided to do something with my time and I started to do patchwork quilting. And then I went to a workshop where it said bring your own project. So when I went… took this to the workshop and I discussed it with the lady, um, I don’t know what to do with this. I don’t know how I’m going to salvage it. Um, but I’d love to save it because it’s… has a lot of memory for me and, and it tells me a story from my childhood. And how my mother brought us up and how it, um… she used to spend time, how she used to find time doing this embroidery, embroideries, er, when we were so young and there was five of us to… five girls and two brothers. Seven of us altogether. So how my mum used to get time to do this I just, er, don’t know. But it had a… it was very, very close to my heart from the time when my mum wasn’t here and I wanted really, really to save the embroidery. So… [laughs]. So I thought, you know, um, I was very tearful, er as I was cutting the embroidery, er, pieces and tearing the, er, er, worn out pieces and saving the embroidery pieces. And, um, and the tutor could see how precious this was to me. So she helped me out and she helped me to plan it and helped me to cut the pieces and helped me to find a way how I can make a quilt out of this embroidery pieces that I cut out as patches. And, um, I thoroughly, thoroughly enjoyed doing it. And it was… became the more I did it, the more it became close to my heart [chatter]. MS: Could you tell me about the colours in the quilt please? PP: Well the embroidery is, um, er, embroidered on a white cotton, um, sheet and it’s, er, um, got a, a colours are green leaves and red and blue flowers. And then the other sheet is all embroidered, um, red threads, very deep red threads. And, um, there were two sheets and, um, two different types of embroidery. And, er, one that il… I don’t know what the name of that embroidery is but it looks very, very much like a cross stitch, but it isn’t, it’s a, a thread on the surface of the material, but it’s through and in and out, in and out from one thread to another. So it becomes almost like a cross stitch but… er, but it does… it’s not a, it’s not a cross stitch, it’s very, very… a tedious way of doing embroidery. And the other one is, um, just flowers embroidered, um, it’s like an over stitch. Um, I’m not very good at, er, expressing what stitches and what sort of type of, um, er, embroidery it’s done. Um, so, er, in order to choose the material, because I wanted the embroidery bits to stand out, I chose the colours from the threading. And, and I thought, um, the maroon would pick up for the maroon threading and the blue from the blue flowers from the other embroidery. I did have a green material as well and I thought well I might be able to put green somewhere, but when I put the two colours together [coughs] I thought green somehow didn’t fit in. So I kept with red and blue and I thought they were just nice colours and it really made the embroidery stand out. MS: And design, was it… did you already have that in your mind when you started? PP: No. [Interruption] no I, I just simply had no way of knowing how I was going to design it. Um, that was with the, um, help of the tutor [noise], she helped me to, to [coughs] design the quilt. Um, and then she, she said [coughing in background] well she, she did the measurements of the blocks and then she, er, we drew it on a piece of paper exactly how to, to do the, er, embroidery. But, um, the side of my sh… bed sh… one of the bed sheets, the, the drops from the side of the bed, this long piece of embroidery. And I didn’t really want to cut the long piece of embroidery because, um, er, I wanted to keep it as one piece. I didn’t want to break the threads, because I thought if I cut the, er, embroidery then obviously the threads will come undone from the sewing or whatever and it won’t be one intact, er, embroidery left. So I wanted to keep the two long pieces as, as, one piece of embroidery as, er, one patchwork. So we worked around those two pieces to fit in the other small pieces of embroidery. MS: Right, and so where did you put those long pieces of embroidery? PP: On the sides [interruption], on the very ends [interruption], on the very ends on the sides and then the small pieces are in the middle with, um, with, with the rest of the colours, with blue and red and white [interruption] with the rest of the colours. PP: Um, how will I use it? Um, at the moment, um, I’ll probably, um, use it, um, er, on my bed. Um, my husband wants to put it on a wall as, as a hanging piece. And, and then I, I would love to pass it on once I’ve used it and enjoyed it and, and had the pleasure of remembering my mother in a nice way. So, um, then I would like to pass it on to one of my children. But only pass it on if they are… really have the desire to wanting [noise] one of the quilts. Otherwise I have nieces who are fighting over it as well [noise]. Er, because they want nanny’s quilt. And, um, so I will decide who wants the most, who’s really craving for it, then I will pass it on [laughs]. They have to earn it! [Laughs]. MS: Are you the only quilt maker in your family? PP: Yes, I am. Er, er, I always, always wanted to do some patchwork, um, because when I, er, um, er, and I grew up in this country and I saw a lot of English embroidery, English exhibitions, English um, um, er, quilt making. Um and then, er I always wondered how it was done and I always enjoyed applique, always looked for the flower applique, because my mum used to teach us how to sew and she used to always divide work for us girls. And she used to say, ‘okay, you know, Pindy, you can do the embroidery’ or ‘you can do the, er, small pieces of work’. I always used to enjoy like sequins and stuff. And, um, and always used to enjoy doing applique. I always used to cut flowers out of small pieces of material left over from my mum. And I used to stick it on the glue… with the glue on, on the c… on the, er, piece of material. And I used to just make it for myself, but I never realised that was the applique I was doing it. I thought it was my own creation, you know, I was doing something that I liked creating, liked doing. Um, because I enjoy art, and it was more of artistic thing for me as well, you know. Um, so it was just one of those things that I never knew it was patchwork, I never knew it was applique, but I was doing it when I was young, when my mum used to teach us doing sewing and stuff like that. Until, um, [clears throat], er, er, I saw, um, something on the internet, er, because I had finished work and I was looking after my mother and I was quite bored with, with long days with my mum and I wanted to do something and then I also wanted a break as well to have time out for myself. And, um, I just saw something on the, um, website about quilting and, and I looked if there was something local for me to, to pick up or something for me to do. So… and it was my son who encouraged me to go for, you know, er something that I really enjoy doing. Um he wanted me… they wanted me to do a course on something, on, er, literature, like reading and wr… literature. And I said, no I’m not going down that road. I just want, you know, rest for, for my brain. I can do something practical, but I don’t wanna do anything, um, you know, mind boggling that I have to really sit down and work at things and, and concentrate a lot, lots of the time. I wanted to do something for pleasure. So I really enjoyed, um, er, going to these quilting groups that I, er, joined. And I really thoroughly enjoyed it and it’s like a little family. MS: How long have you been quilting and quilt and making? PP: Um, I’ve joined a group with, um, for, now I think 2013. So I’ve been doing quilting since then. MS: And do you have any preferred styles or techniques in quilt making? PP: Um, not, not at the moment, because, um, I call myself, I’m a learner and I like doing things by learning from others. Um, the group that we’re, er, I’m in, um, we are very friendly group. So, er, we pass on our techniques to one another, how we learn. 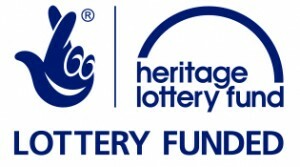 And if we’re st… if you are struggling, then they are very kind to help you as well. So I enjoy learning and I’m enjoy… er, at the moment I’m just a beginner so I’m enjoying it. MS: What do you enjoy most about quilt making? PP: The finish of the quilt [laughs]. The end result [MS: Yes]. It’s a great satisfaction, you know, that it’s you who did it, it’s your piece of work. And because you’re, you’re, um, piecing it and you’re enjoying it, er, doing appliques and, and when it, when it all comes together, the end results. Even though there are little corners that are not meeting together or anything, but only your eye can see it. But when you put it in front of everybody, if you don’t say it it’s the wow factor that you get, it’s, it’s such a satisfaction thing [noise]. I enjoy it. MS: On the reverse side, is there anything you don’t enjoy about quilting? PP: Um, um… not really, no. I, I like I said, from… I always, always was interested in patchwork. So I really do enjoy doing It. But, um, the reverse side is I would love to have lots and lots of time to do it [laughs]. MS: Going on from that then, when and where do you, do you do your quilting? PP: Um, at home, I, I used to do it here in the dining room and then, um, um, er, now I share my husband’s office and I do… part of the office is turned into my quilting corner and his corner is his office. And my… other end is my quilting corner. So I enjoy doing that, but I’ve taken over his office really [laughs]. MS: How much time would you say that you spent? PP: Er, on average I think I spend probably, um… maybe an hour, two, three hours sometime; it depends what I’m doing and if I really get into it, I would like to finish it. Um, but it’s like I said it’s the time is the essence. And, um, er [sighs], er, at the moment I don’t get that much time, because I’m looking after my grandchildren [laughs]. So I’d love to… er, on, on, on an… if, if, if I get a day, a good day I can sit and enjoy and do it all day. Yeah. It, it depends, it, it varies. It varies from time to time. MS: Where do you get your ideas and inspiration from? PP: From the group. And sometime, um, when we go to exhibitions we look at it and sometime we do projects and if there is a project that I like to do I would, I would, I would particip… take it on. MS: When you go to the exhibitions and you look at other people’s quilts, what do you look for in a quilt? PP: Oh, design. I love the designs and I love the technique they use. Um, and the colours, the way the colours blend in together it… that’s something that, um, um, I, um, I, I’m working on now. I love, I love blending colours and love seeing how colours work with one another and create a colour circle. MS: What do you think makes a good quilt? PP: Oh… [laughs] um, [whispers] I don’t know. [microphone noise] Um, I think it’s the, the colour scheme and the design and the passion that people put into making the quilt. MS: Right. 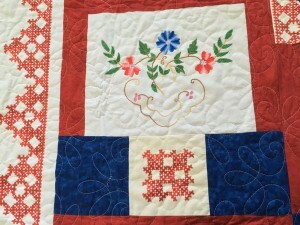 How do you feel about hand and machine quilting? PP: Um, I enjoy doing machine quilting more than I enjoy hand quilting. But if there is a hand quilting that if I want to do, then I do it. Um, maybe in the evenings when I’m watching television then, you know, the hand bits… all hand, er, quilting that I need to do. But I’ve not tried doing hand quilting at the moment. But I, I’ve seen the machine one [interruption]. Mind you I’ve done, Dear Jane isn’t it, its hand quilting? [Interruption] oh of course, I’ve done one [laughs] Dear Jane. MS: Can you explain Dear Jane? PP: Oh Dear Jane quilt [laughs]. It, it’s, er, it’s, it’s enjoyable but hard work. Um, and it’s all hand quilting. But I cheat, I do machine quilting [laughs] in between. I sew the bits and pieces with a machine. But I do the quilting bit with hand and that is really nice. MS: Right. On your… going back to your, your quilt, um, is there a favourite block on there that, that you have? PP: Er… [microphone noise] oh God it’s a difficult one. I think the whole quilt is, is lovely. Um, but the, the maroon is my favourite, er, the maroon blocks are the most favourite, the maroon embroidery bit is, is [interruption] my favourite. Because I think that’s taken my mum a long time to do, you know, I can see the amount of work that’s gone into it. And that was the one that drove me to save my mum’s embroidery pieces. MS: When you’ve made your quilts, what do you do with them? PP: Um, so far the quilts that I’ve made, I’ve made them for my grandchildren and they’re using them at the moment. And, um, I… the two I’ve finished I have them for myself. And, um, and I haven’t passed any on. So, so far what I’ve made I have it at home. 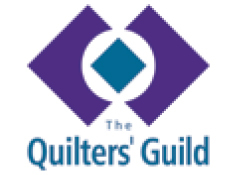 MS: What do you think is the biggest challenge that you face as a quilter today? PP: Oh… I think… [microphone noise] okay, um, the challenge for making a quilt, I think It’s the time and the cost of the materials and choosing the right colours. And, um, er, I think those are the most, er, important, um, challenges for making quilt. MS: Right. The quilting on your quilt, um, can you tell me a little bit about that please? PP: Um, when I finished, um, I was struggling to think how I was going to quilt it and, and I was, I was toying between having it quilt or doing it myself. And again, that was time. Um, if I did it myself as a hand emb… hand quilting, um, then I’d be there for a year, forever doing it myself. I couldn’t see that I could finish it. Um, then I did l… um, ask colleagues and friends and, um, I found a quilter to send it away to. So… and I… chose the design when I took the quilt over there was to, to have the, um, quilting done near to the embroidery like picking the design from the petals so it would be sort of like curls and leaves. And so it’s very close to the embroidery, the way the quilting has been done. MS: Fine. The size of your quilt, do you know the size of your quilt? PP: Um, I think it’s, er, 63 by 92 inches? MS: Oh right. And did you start off with a size that you wanted to…? PP: No [interruption]. No, not at all, because, um, er, like I said before, um, I wanted to keep the, the long embroidery pieces and we worked around that. So I didn’t know what size it would end up, er, in the end. But, er, whatever the size I was trying to save the embroidery so I was working around that. And then the nice red and plain pieces in between just, I think, enhances the embroidery [chatter]. MS: Why is quilt making important in your life? PP: Um, it… er why is it important? It was… I did it for pleasure, hobby, because as a child I enjoyed putting… cutting pieces, small pieces into flowers of cu… you know. It’s like when you, when you were young and cut pieces of paper, I was cutting materials to put together, but I never ever knew that I was doing patchwork. So f… I, I dunno, I think I had a passion from when I was young. And, um, ac, it’s actually come out now when I’m retired and I’m enjoying it. And, um, I’m hoping I enjoy it years to come and make lots and lots of more important things to pass on to my family and my grandchildren [chatter].